New research led by LASP scientist Brian Toon uses a three-dimensional (3-D) model of Earth’s climate to assess the role of various factors in influencing historic global temperatures and resulting sea ice formation and change. Toon, along with doctoral student Eric Wolf, adapted the 3-D model to incorporate the complex and dynamic interactions between the atmosphere, cloud formation, energy radiation, land and ice cover, and the hydrological cycle to demonstrate how the Earth maintained a global mean temperature hospitable to life. 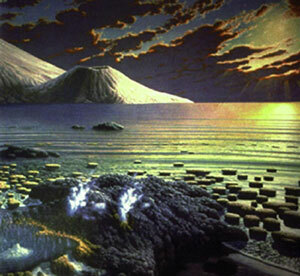 The model attempts to solve the “faint young sun paradox” of the Archean Eon—from about 3.8 billion to 2.5 billion years ago—when the Sun was up to 30 percent less active, but geologic evidence points to a climate as warm or warmer than today. The consideration of additional climate system factors in the new 3-D model has created a much more accurate and dynamic picture of Earth’s climate than previously relied-upon one-dimensional models, but also presents a number of challenges; for example: When mean temperatures are modeled below 55 degrees Fahrenheit, extended periods of catastrophic glaciation become the norm. Increasing the percentage of carbon dioxide in the atmosphere keeps temperatures warmer, but geological evidence indicates that such high levels of CO2 were not found at that time. The new model accounts for the influences of additional greenhouse gases on warming and the processes that create them. Wolf presented the new findings at the American Geophysical Union (AGU) Fall Meeting held Dec. 5- 9 in San Francisco. In recognition of his innovative work on the effects of aerosols on clouds and climate, the AGU awarded Toon the 2011 Revelle Medal, which recognizes outstanding contributions in atmospheric sciences, climate, or related aspects of the Earth system.